Oceans cover more than two-thirds of our planet and are a major source of biodiversity, food and medicines as well as containing vast reserves of oil, gas and marine aggregates for use in many industrial processes. Wireless technologies that are capable of producing real-time video have the potential to open the oceans to further exploration and monitoring. They will be particularly useful for the inspection and maintenance of underwater pipelines and cables and of offshore oil and gas fields, where waters are too shallow for remotely operated vehicles and where the use of divers is often impractical and costly. Existing technologies like acoustic communications and low-frequency radio waves are limited by narrow bandwidths and the need for large antennae and high-transmission powers, making them unsuitable for streaming good-quality, real-time video. 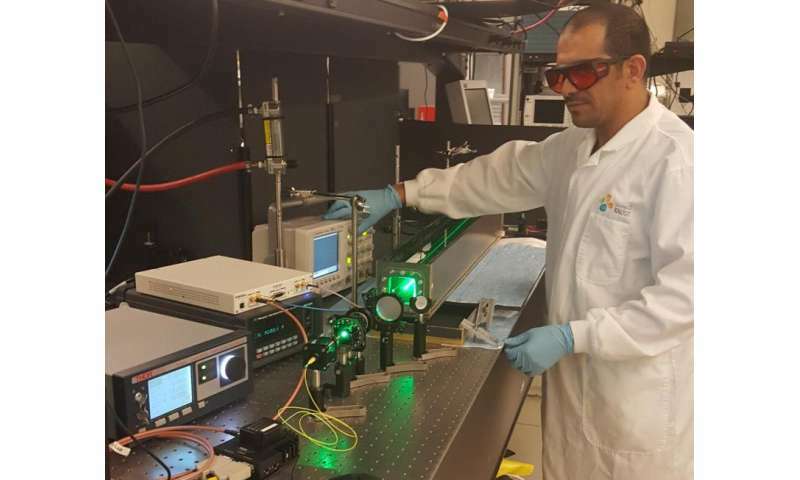 PhD student Abdullah Al-Halafi, with his supervisor Basem Shihada and colleagues, explored underwater wireless optical communication (UWOC) systems, which consume significantly less power and offer the higher bandwidths required for streaming live video. "We first built the real-time video transmission system and then integrated it into an UWOC setup," explains Al-Halafi. "Although the design and development of the system were very challenging, its ability to be programed enabled us to reconfigure the system into several different arrangements." To improve the accuracy of the detected signal, the researchers first used a technique called quadrature amplitude modulation to increase the representation of information carried by the signal for a given bandwidth. They then compared it with phase-shift keying, which changes the phase of the carrier signal, while optimizing the transmission for each configuration. To check how well the system performed, the team developed an innovative algorithm to measure errors that occur during transmission called the bit error rate. Also, by passing the signal through a five-meter trough containing water of differing turbidity, they were able to test the quality of the video under different types of ocean water. "Our system produced the highest-quality video streaming so far achieved in UWOC systems and provides a reconfigurable and cost-effective communications system for underwater live video streaming," says Al-Halafi. "It could lead to advances in underwater research and the discovery of new resources." Can video streaming over mobile broadband networks be improved?